The Chinese regime is increasing its military presence around North Africa. It is trying to acquire a military base in Djibouti in the channel between the Gulf of Aden and the Red Sea, and is now building its presence in the waters between Greece and Egypt. The Chinese regime is holding joint naval exercises with Russia in the eastern Mediterranean Sea. According to TASS Russia News Agency, the operations, which began Monday are part of its Joint Sea–2015 for Russia exercises. Russia has some rights to be there, through its recent acquisition of Crimea from Ukraine, with ports in the Black Sea. According to TASS, Russia created a permanent Mediterranean naval task force in 2013. The Chinese regime’s interests in the region, however, are likely not just about naval cooperation with Russia. Its interest here is likely trade chokepoints, and the Chinese regime’s presence can now be felt in just about every major trade chokepoint in the world—whether it be the South China Sea, the Horn of Africa, the South Atlantic, or in its construction of canals in Panama and Nicaragua. The nature of the trainings raises some questions about which types of security threats they’re defending against in the trade chokepoints. The exercises include trainings for anti-ship, anti-submarine, and anti-air defense protection, according to TASS. They also include operations to protect against radiation, chemical, and biological agents. 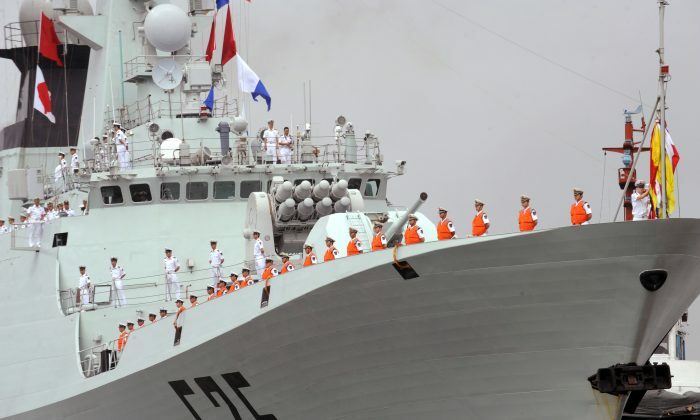 The Chinese regime has a larger push to build a global naval presence. It allegedly wants to build 18 overseas bases in locations including Thailand, North Korea, and Namibia. The Chinese regime will allegedly build a naval base in Walvis Bay, Namibia, which will extend its military reach. Australia may help United States challenge the Chinese regime's growing aggression.